The latest from BuzzFeed News on the Ottawa shooting and how the city is coping in the aftermath. Prime Minister Stephen Harper and his wife, Laureen Harper, lay flowers at the Canadian War Memorial in Ottawa on Thursday. Canadian police confirmed Thursday there was just one gunman. Cpl. Nathan Cirillo was shot and killed by suspected gunman Michael Zehaf-Bibeau, who was later shot dead. Raw audio of 911 calls after the shooting began were released Thursday. Friends remembered Cirillo as "an outgoing person." 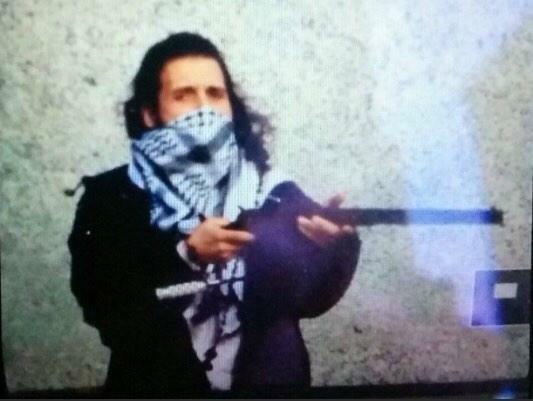 Here's everything we know about Zehaf-Bibeau. Prime Minister Stephen Harper on Wednesday called the shooter a "terrorist." RCMP Commissioner Bob Paulson shows surveillance footage of yesterday's attack. Police say shooter wanted to travel to Syria. Police said Thursday that the Michael Zehaf-Bibeau had told people he wanted to travel to the Middle East, but was unable to secure valid travel documents from federal officials. He was not one of 90 "high-risk" individuals under investigation by the Royal Canadian Mounted Police, RCMP Commissioner Bob Paulson said. 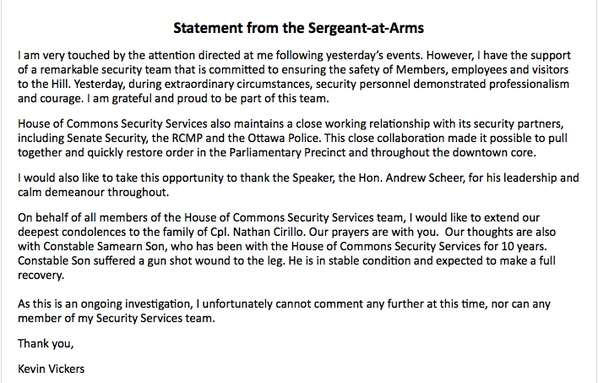 Sergeant-at-Arms Kevin Vickers released a statement saying Constable Samearn Son was injured by the shooter, and is in stable condition. Kevin Vickers was treated to an emotional standing ovation in the House of Commons. He fought back tears. 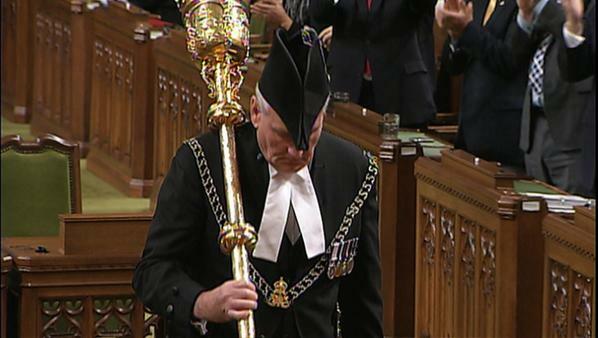 Here is Sergeant-at-Arms Kevin Vickers, in a photo published by CBC. He is credited with shooting and killing the Ottawa gunman. Prime Minister Harper said the objective of the shooter was to "instill fear and panic in our country and to interrupt the business of government." He said Canada needs to strengthen its laws and police powers in surveillance. Sergeant-at-Arms Kevin Vickers, who is recognized as having stopped the shooter, got a prolonged standing ovation in the House of Commons Thursday. Ottawa Police Chief Charles Bordeleau confirmed that police were satisfied there was only one gunman involved in the shooting yesterday in an interview with CBC News. He said: "We're satisified it was one individual who was responsible for the tragic shooting of Cpl. 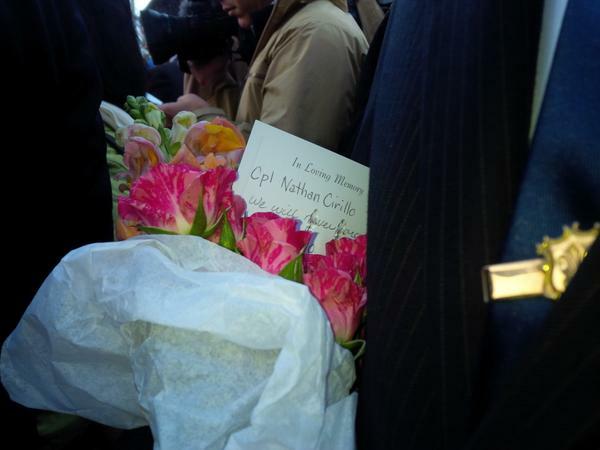 Cirillo at the Cenotaph, who then made his way up to Parliament Hill and was then engaged inside the building." Bordeleau said the police only stopped seeking a potential accomplice once they were entirely satisfied there was no longer a threat to public safety: "We were actively looking for a second individual and that&#39;s why we extended the perimeter to 8 p.m. until we were fully satisfied there was no longer a threat to public safety." 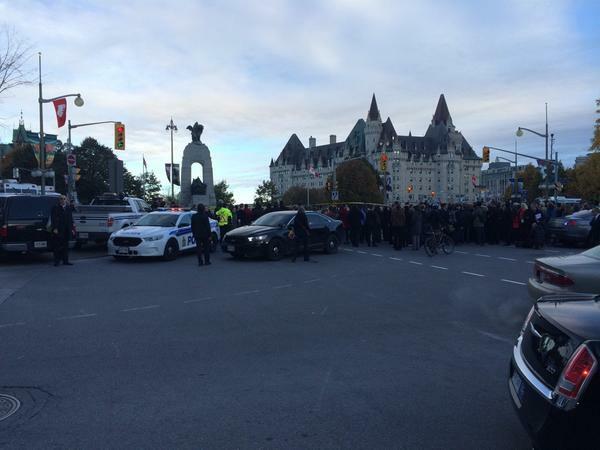 He added that the area around the Cenotaph remained closed as it was still being treated as a crime scene, and Parliament Hill was still not open to the public. The civil service have now returned to work, but Bordeleau asked the public to be "vigilant." The mother of shooting suspect Michael Zehaf-Bibeau told the AP she is crying for the victims, not for her son. "Can you ever explain something like this?" she said. "We are sorry." 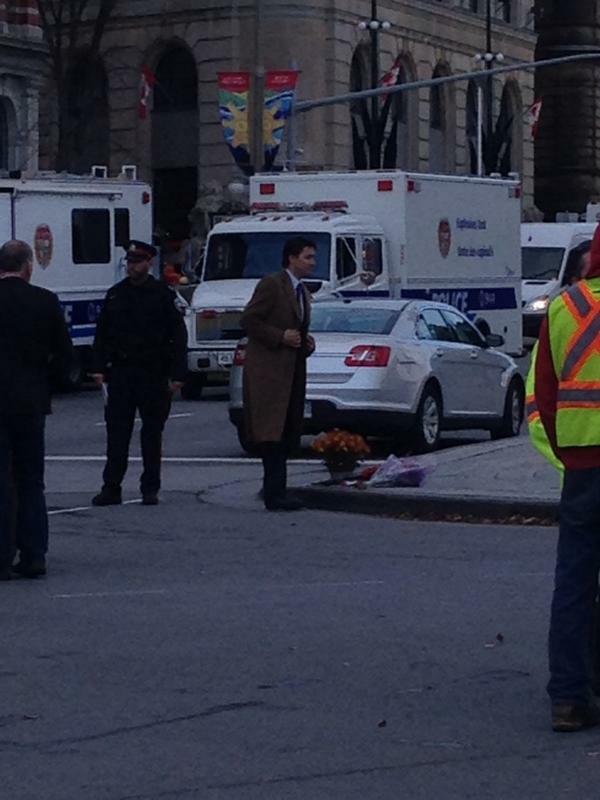 Government officials, including Prime Minister Stephen Harper, on Thursday morning gathered at the memorial where Cirillo was shot to lay flowers. 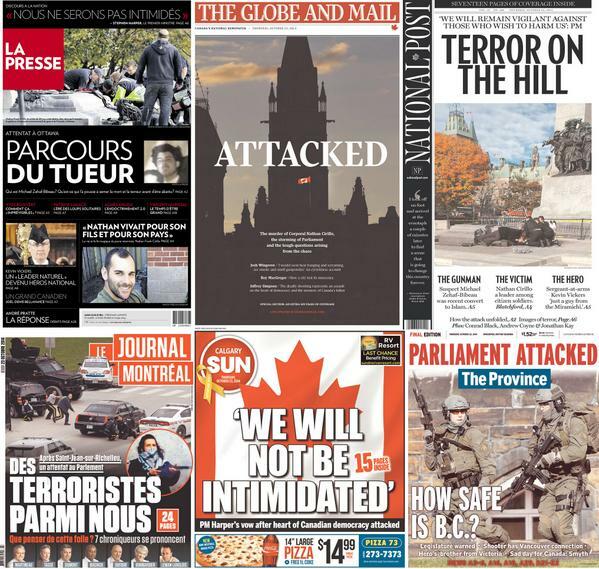 The Ottawa Citizen obtained the raw audio of the first 911 calls about the attack. It was reported quickly that "one soldier has been hit." Canadian police say there was only one gunman in the attack, according to the Associated Press. Authorities previously said there could be more than one gunman, and that police procedure mandates they treat shooting incidents as if there are multiple shooters. What #Canada awoke to this morning.